So your belt is tooled, dyed, painted and oiled. Now all we have to do is antique it and we are ready to line and stitch it! This is the point at which many craftsmen new to leatherwork will make a few mistakes. I hope that my process helps you to clear up this step. You certainly do not have to antique your belt but I feel like the antique really helps to make the tooling stand out and gives added tone and depth. The first thing that most people new to leatherwork miss is that the belt must be sealed with a resist before applying the antique. Whether you are using the paste antique or the gel, a barrier is needed so that the overall color and tone of the belt is not changed. The antique is not meant to change the color of the leather, its main purpose is to fill any cuts, impressions, and background texture to highlight and shadow the depth of the tooling. This is why I get the final color of the belt with oil before this step; because once the belt is sealed I can’t get oil into the leather if I want it darker. The resist I use, or sealer, is Feibings’ Tan-Kote Finish. This finish is not a lacquer finish like NeatLac or WyoSheen, which would lift a lot of any paint work off the belt. If you are finishing a belt that doesn’t have any paint applied then these finishes are great to use. But if the belt has a lot of paint then it’s best to stay away from these finishes and use the Tan-Kote. I apply a liberal amount of Tan-Kote on the belt and work to make sure it’s even and doesn’t have streaks. Now I let this dry really well, at least an hour or so. Once the finish is dry, the belt is ready for the antique to be applied. I use square pads cut from scrap sheepskin to apply all my finishes… keep a pile of these cut so they are ready for any finishing task. I use the Feibings Antique Paste, and the color I prefer is the Dark Brown. They make a few different colors and they are all fantastic but the dark brown is my go to color for the look I prefer on my products. You can put a dollop of paste on a small square of plywood which allows you to wipe up as little or as much paste as you need with the sheepskin square during application. You want to apply the paste liberally to the belt and work it into the tooling in circular motions to be sure and get it into all the cracks and crevices being sure to not leave any areas missed by the antique. Do this to the entire belt. It will appear to onlookers that you have gone mad and you are ruining a perfectly good belt, but stay calm and keep working it around. Here is where differences vary, some say to leave it for a few minutes before cleaning… I say once you’re sure that it’s worked in well, then take a clean pad and begin wiping the excess paste off the belt. The goal here is to attempt to get as much of the paste off the belt as possible. You want to be somewhat gentle as to not burnish the grain of the leather but you want to clean it well with clean pads until you’re satisfied that you got it all. All that should be left is what is down in bevel lines, background texture, decorative cuts, etc. My final step is to take a magic towel (This is a towel that is used to wipe hands after oiling, antiquing, cleaning machines, wiping knives after sharpening, spilling coffee, etc.) or any soft hand towel, and gently buff the belt to further polish any residual antique and revive any lost luster from the resist coat of finish. Don’t go crazy here, as previously mentioned, we don’t want to burnish the grain of the leather but we do want it clean of excess antique. Now turn the belt over and look at the back… see that mess? If you would have lined the belt before the finish steps, then your belt liner would look like that… I don’t care how clean you think you can be, antique takes no prisoners. 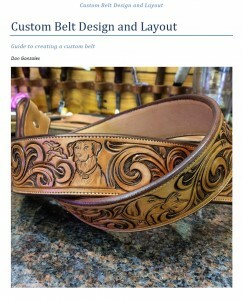 This post is an excerpt from out eBooklet “Custom Belt Design and Layout” we posted a couple of weeks ago. We will soon have more of these eBooklets available walking you through the step and processes I use in the shop in creating our custom pieces. If you are interested in purchasing this eBooklet then click the link below and download a PDF copy today! *I apologize for the lack of photos in this post… fast and furious this morning and Freddy is cracking the whip! I will try and snag some pics during my day and post them in a followup post!